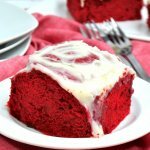 Our absolutely decadent Red Velvet Cinnamon Rolls are surprisingly easy to make with this box cake shortcut! Click for photo step-by-step recipe! Combine cake mix, flour, warm water, and yeast in a large mixing bowl. Once dough forms, place dough on a flour-dusted surface and knead until the dough "bounces" back after touching it. Place dough into a large glass bowl and brush the top of dough, as well as the sides of the glass bowl, with a Tablespoon of oil. Cover bowl with a kitchen towel and allow to sit for an hour. After an hour, the dough should have about doubled in size. Remove dough from bowl and place onto a floured surface. Use a rolling pin to roll dough out to about 1/8 inch thickness. Use hand to roll dough sheet into a log, then slice into rolls. Cream together butter, cream cheese, powdered sugar, vanilla and whole milk together until smooth, using an electric mixer or stand mixer. Remove from oven and smother with the cream cheese icing. Allow cinnamon rolls to cool slightly before enjoying.